Black History Month used to be one of my favorite times in school. And since I went to all black schools most of my life, it was always a big deal. Learning about all the amazing people who helped get us to where we are now was/is so inspiring. It motivates me in so many ways to do and be better. And going to a Historically Black College/university (HBCU), for college and grad school, there was no shortage of black history. The year I didn't go to an all-black school they skipped black history altogether. I was in fifth grade, and I was so disappointed. I finally told my mom, who came up to the school and talked to the principal about it. He assured her that he would take care of it, but he didn't. So she bought me a series of black history books that I could read year around. They became some of my favorite books in middle school. That was the same year I went to camp, and was accused of not taking a shower because I didn't get my hair wet. I was the only black little girl, and my hair was a BIG deal. These experiences were my first personal introductions to being different (i.e. black in America). In my house, we never shied away from racially-based conversations. These conversations helped me understand the racial complexities that existed before me and the improvement and/or lack thereof currently. Most conversations were no holds barred, and in hindsight, may have been too advanced for me sometimes. But I appreciate my parents for not trying to hide these things from me. Fast forward to today and, of course, I'm eager to share our history with my children. But I've never really considered how I might teach my children about their rich heritage. There's so much triumph, but there's also a lot of trial and tribulation. And I feel the need to share both. I want to be very intentional about sharing this information with them. Even though my children are small I want to start these lessons now. But how do I do this without creating fear and/or bias? Frankly, I don't know. But a good place to start is finding a book that matches what you want to teach. I love the diversity in the book section at Target. I buy most (all) of the books that they have with children of color. One of the first books I bought was a book by Taye Diggs called Chocolate Me. It's a book about a little (black) boy who is being teased by a group of (white) boys about the way he looks. The book never outright describes the racial tension, but to be completely honest when I first read it to my daughter I cringed. I considered putting it away until I felt she was old enough to understand what was going on. Which was probably going to be too late. But I as I continued I realized the message she was getting was different than the one I was getting. I used the book to explain how we are all different and special we all are in our own unique way and how we shouldn't make fun of people because they're different. It was the perfect narrative at that time since we had also just finished reading I Like Myself by Karen Beaumont. She walked away with a valuable lesson that I can later parlay into a larger socially conscious racially-based conversation. Where I can create a narrative that helps my children understand the multifaceted world they live and what they can do to make it better. Part of my parenting style is using an age-appropriate philosophy when tackling hard subjects. I start very basic and work my way up to a more complex explanation. So I felt my explanation of Chocolate Me initially was appropriate for my daughter's age at the time. Now that she is getting older, and is aware of a lot of differences, I am using this book to discuss race a little more. The truth is she may not get it all, but I want to start the conversation. I used Chocolate Me for a book club my daughter is apart of and it was received with mixed feelings. A few of the parents felt like it was too advanced for their children, citing they were not ready to have racial discussions yet. I can totally respect your right as a parent to introduce these subjects when you feel your child is ready. But it is my goal as a mother to prepare my children for life good, bad or indifferent. And as much as I wish I could avoid the harsh realities of life, I can't. What good would that do for my children? I might not be there when someone makes fun of the way they look the first time. Of course, it would make my life less complicated, but I would be doing my children a disservice. The hard truth is sometimes there is no appropriate time, or way, to bring up the injustices of the past. 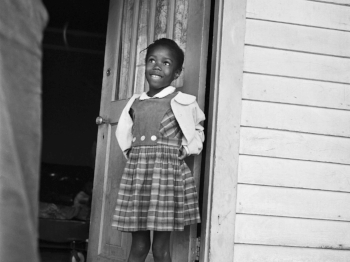 Ruby Bridges, at the age of 5 in 1960, along with her mother was escorted by federal marshalls to desegregate an all-white school in New Orleans. She was not spared the harsh realities of life even at the age of 5. Yes, times and current racial struggles are different, but not obsolete. Avoiding talking about racial issues doesn't change the fact that it happened, and it should be celebrated and remembered. So during our first official homeschool year Black History Month I've decided to choose a person and/or organization a day that made a positive impact on black history. The lessons will be simple. We will watch a small video or read a book. We will have a basic discussion about what we saw or read. At the end of the month, we will do a recap and a tribute. I'll provide a complete list of people we've studied at the end of the month. 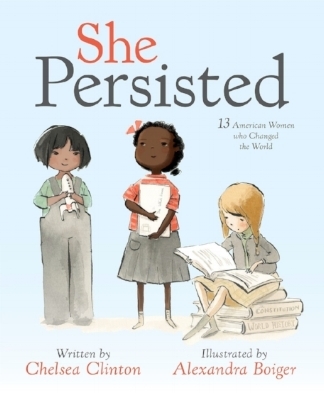 A few of our selections (Harriet Tubman, Ruby Bridges, Oprah Winfrey, Claudette Colvin) are in one of our favorite books, She Persisted by Chelsea Clinton. It's filled with great women who made history. In my opinion, it should be a staple in little girls book collection. We can't be afraid to have these conversations with our children. It's totally your right as a parent to decide when to bring up these sensitive topics. But understand that your child is very aware of things long before you will ever be ready to have those "uncomfortable" conversations. They are little sponges soaking up whatever knowledge and information they come in contact with. They draw conclusions based on the narrative they see and based on what they have been taught. For me, this means getting ahead of that to create the narrative I want them to live by. If we really believe all people are created equal it is our responsibility as parents to help our children understand this, and it should be our privilege to teach them.